(22nd Feb 2016) The Boston Global Forum (BGF) is continuing to host experts and build up its institutional expertise in its cyber-security project this year, a key part of the BGF-G7 Summit Initiative. One of the most important goals of the Initiative is to craft norms for national and international laws and policies in order to promote global cyber-security. As part of this mission, the BGF urges that the roles of the G7 nations in setting and maintaining the norms be clearly established and promoted, hopefully at the G7 summit in Japan on May 26-27. Such world-famed experts on cyber-security as David Sanger and Bruce Schneier have already taken part in BGF sessions. They and other experts have discussed in BGF forums the need to set ethical and legal norms for digital activities to replace the current chaotic and sometimes criminal global digital environment. Cyber-expert Adam Segal also cited the need to build such norms when he spoke at the Christian Science Monitor on Feb 4. Other cyber-security experts, such as Prof. John Savage, a renown computer scientist, will join us in conversations in coming weeks. And the BGF will continue to discuss cyber-security and other issues of international peace and security with past and present government leaders. 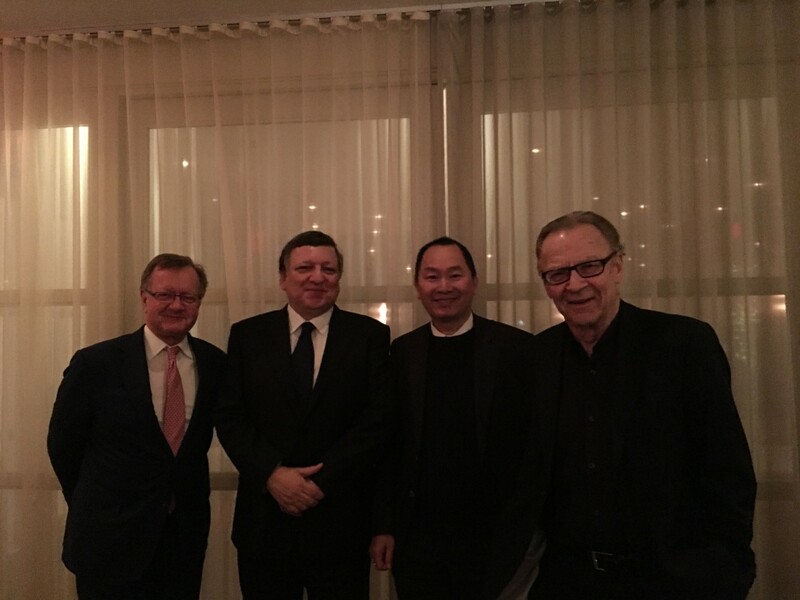 Joining the BGF-G7 Summit Initiative team for a four-hour meeting and a dinner on Feb. 20 in Cambridge, Mass., was Prof. Jose Barroso, former president of the European Commission and former prime minister of Portugal. He contributed strong and useful advice for building the Initiative, based in part on his experience of having attended the G7 Summit (called the G8 Summit before Russia was excluded because of its seizure of Crimea from Ukraine) 10 times in his role as the leader of the European Commission (a role sometimes called “president of Europe’’). The BGF has been working on its cyber-security project since last year. The BGF’s Global Cyber-Security Day was held last Dec. 12 and featured discussions with people around the world. It followed the BGF’s creation of the Ethics Code of Conduct for Cyber Peace and Security (ECCC) earlier in 2015. Besides Mr. Barroso, such major leaders as U.N. Secretary General Ban Ki-moon, Japanese Prime Minister Shinzo Abe, and Vietnamese Prime Minister Nguyen Tan Dung have also endorsed the principles of the ECCC and Global Cyber-Security Day (GCD). ECCC and GCD are both affiliated with the Global Citizenship Education Program of the University of California at Los Angeles, a combination with the United Nations Educational, Scientific and Cultural Organization (UNESCO). We will continue on this site to bring cyber-security initiative as we approach the G7 Summit in Japan in late May.